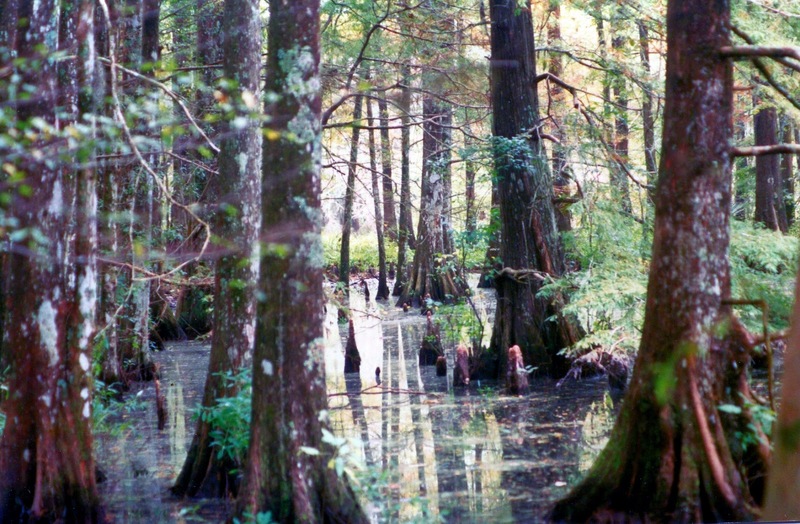 Excitement ran high when, in 1907, a cache of gold coins was found buried on Honey Island in the Pearl River Swamp. Here is a transcript of the article that appeared in the November 23, 1907, edition of the New Orleans Item newspaper. 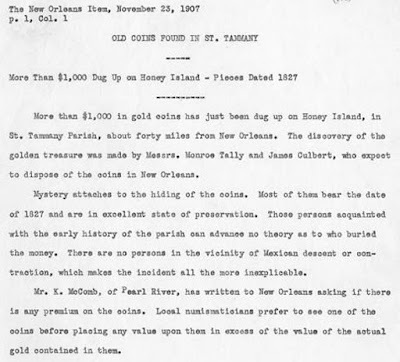 More than $1000 in gold coins has just been dug up on Honey Island, in St. Tammany Parish, about 40 miles from New Orleans. The discovery of the golden treasure was made by Messrs. Monroe Tally and James Culbert, who expect to dispose of the coins in New Orleans. Mystery attaches to the hiding of the coins. Most of them bear the date of 1827 and are in excellent state of preservation. Those persons acquainted with the early history of the parish can advance no theory as to who buried the money. There are no persons in the vicinity of Mexican descent or contraction, which makes the incident all the more inexplicable. 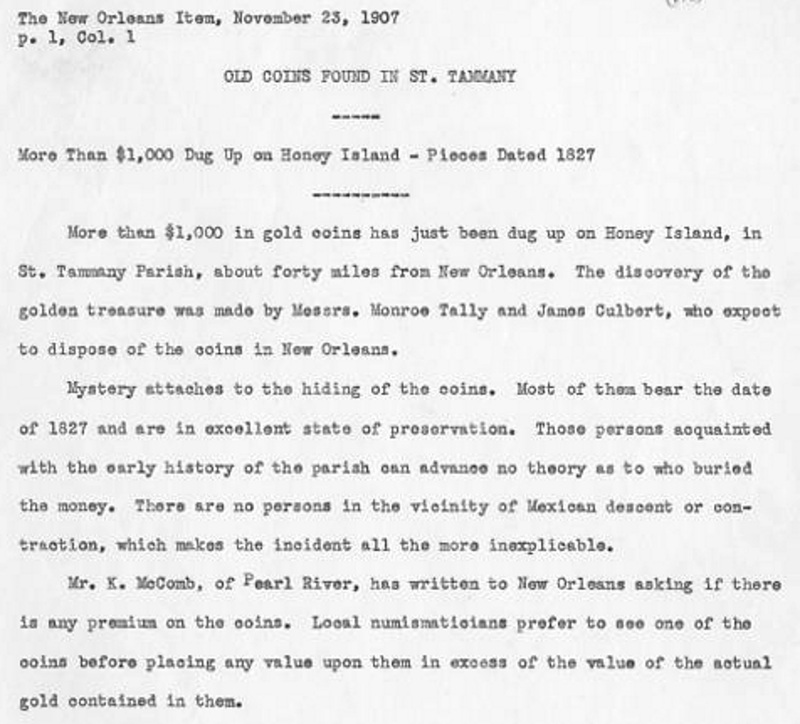 Mr. K. McComb of Pearl River has written to New Orleans asking if there is any premium on the coins. Local numismaticians prefer to see one of the coins before placing any value upon them in excess of the value of the actual gold contained in them. How likely is it that pirates buried gold in the Honey Island Swamp? Actually, pretty likely, since there were lots of "pirates" engaged in illegal activity in New Orleans and then escaping to the swamp. One of the better known was Jean Lafitte, but there was also Pierre Rameau and his Chats-Huants. 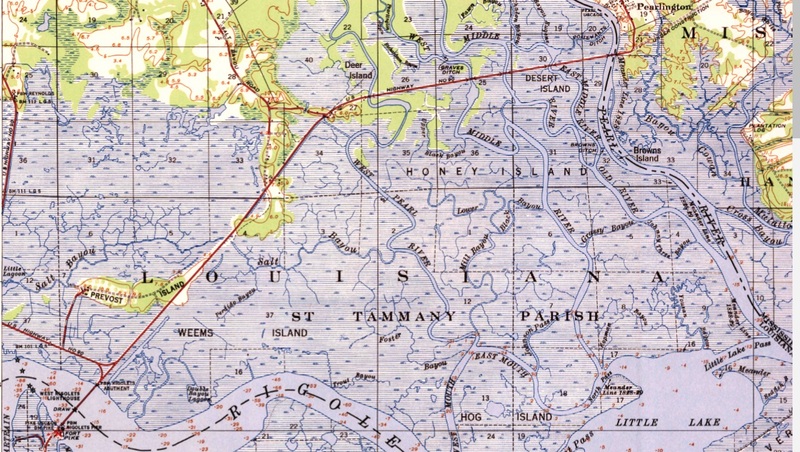 A passage from the book "Gumbo Ya-Ya: Folk Tales of Louisiana" notes that "Pierre Rameau and his Chats-Huants (Screech Owls), a notorious band of buccaneers, had their base of operations at Honey Island." "It is believed much treasure was buried on Honey Island by the Screech Owls, and one or two hunters stumbled over an iron chest filled with Mexican money dating from 1827, and worth about $1000." After a frantic additional search of the area, nothing else was found, according to the book. Meanwhile, in a book entitled "The Boys With Old Hickory," it is recounted that Pierre Rameau was just one of several pirates hold up in the swamp. 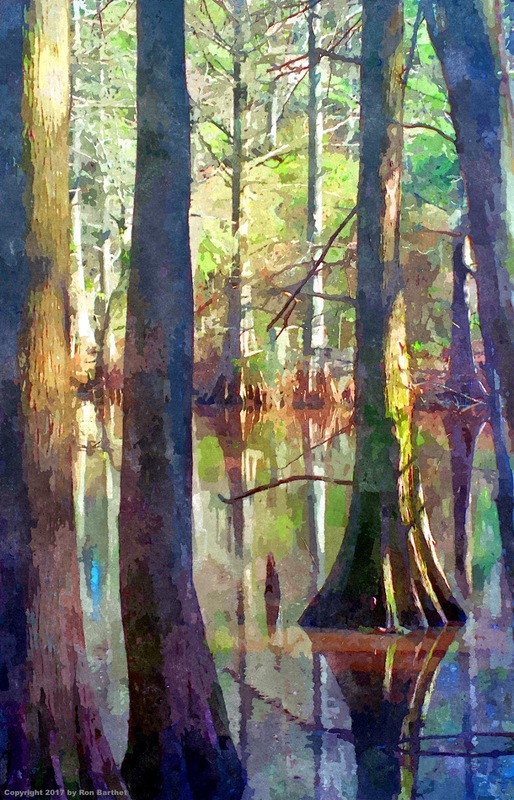 "There are a lot of desperate fellows who have their headquarters up in the lagoons or swamps or bayous on the other side of town," says one area resident. "From all I could hear I should think they're a good deal worse than the Baratarians. They're just cut-throats and thieves." The account goes on to conjecture that the desperadoes are somehow organized, even with their own secret society, that are somehow "protected" from the officers of the law by the members of that society. The Chats-Huants were identified as one of those societies. "They'd helped Pierre Rameau out of more than one bad scrape," the book stated. "It seems that Rameau goes right into the town and into their meetings, too." But the society members have been known to help him escape the law, even when he is surrounded and almost arrested. 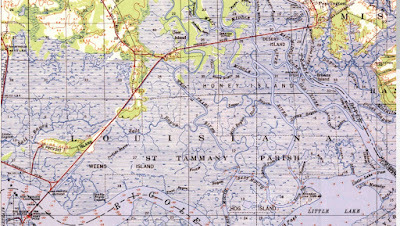 In the Deep South Genealogical Quarterly of 1965, it is said that as Jean Lafitte gathered around him the Baratarian smugglers and built a pirate empire on Grand Terre a hundred miles below New Orleans on the Gulf, so did Pierre Rameau gather about him the reckless and the lawless, who came to be known as the Chats - Huants (Screech Owls) and created a Robbers' Roost on Honey Island up the Pearl River, an inaccessible and now almost forgotten area of Swampland ideal for concealing criminal activities.